14-19 December 2013. 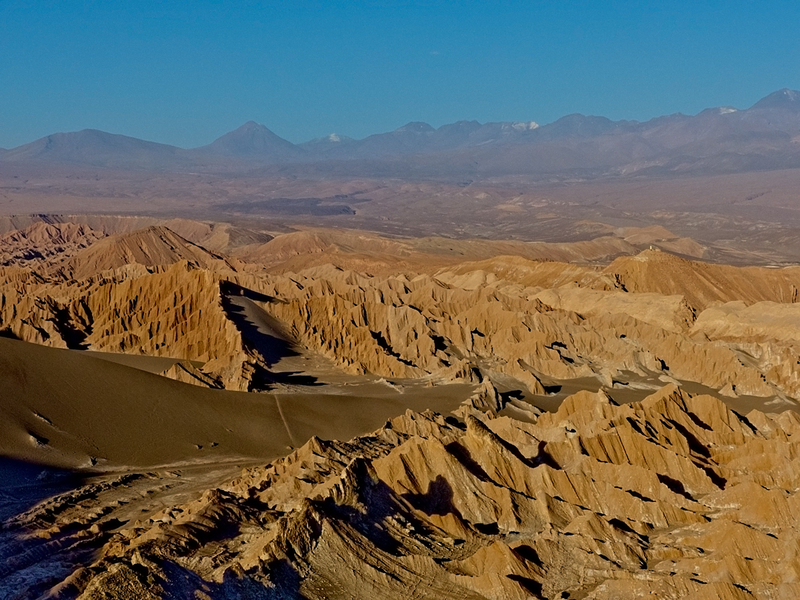 Once again we boarded one of Chile’s luxurious double-decker buses, took our seats in the upstairs front row, and journeyed east from Antofagasta to San Pedro de Atacama. 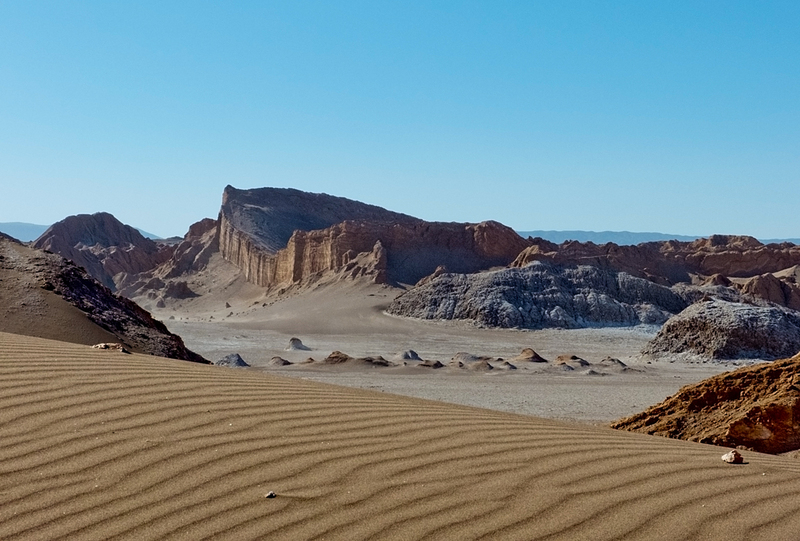 We thought the scenery of the Atacama Desert had been pretty spectacular so far, but we discovered it was just beginning. It’s a roadside shrine. 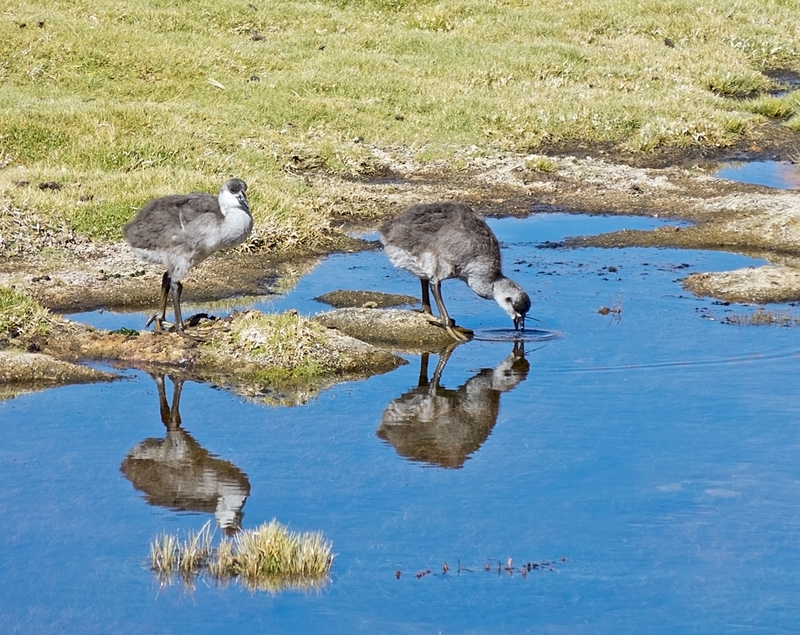 We saw them frequently in Argentina, and then again in Chile as we travelled from Santiago north to Antofagasta, but they seemed to increase exponentially the further north we got. Dozens of them, hundreds probably, seemingly one about every half kilometer. They are all shapes and sizes, from a simple small cross, to a small wooden “house” about 12 inches high, to quite large structures. What they all have in common are crosses, all kinds of “bricabrac” that presumably has some meaning for the dead, and are open to, and face the road. 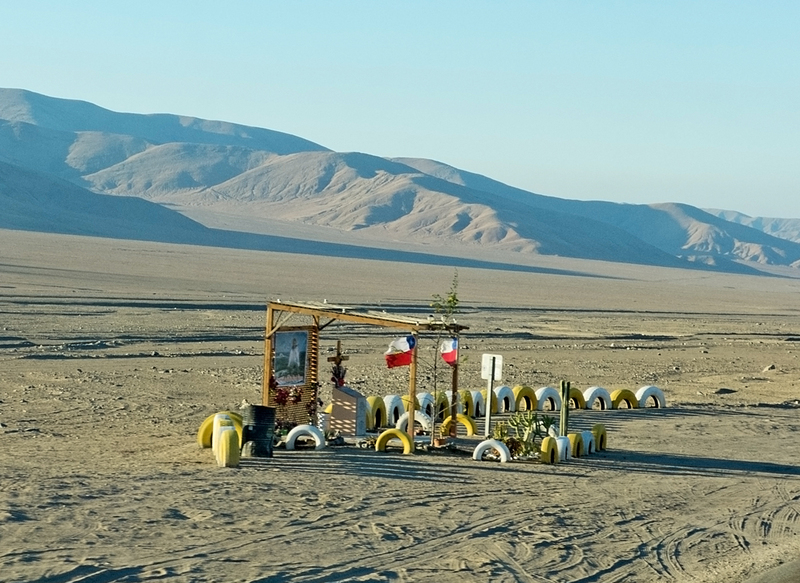 A variety of different materials are used – wooden buildings, old tires as seen above, painted rocks to outline a pathway, tiled structures, flags, some had bushes (though I have no idea how they survive in the desert), some had the name of the person who had died, one had the message Adios hasta siempre Marcello, and one was so large it contained a car mounted on a platform. If ever the desert scenery became monotonous, which it didn’t, there was always the endless and varied array of shrines to attract our attention. 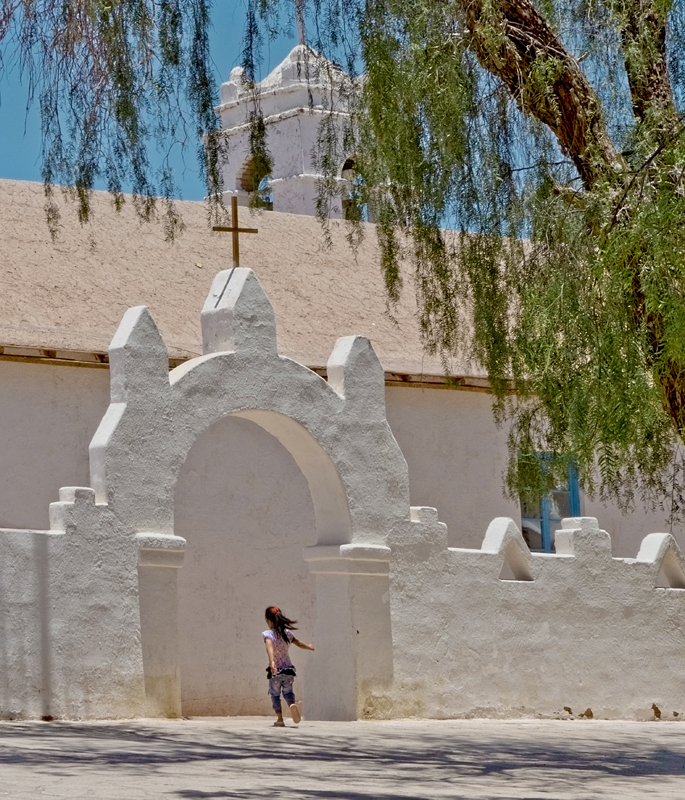 San Pedro de Atacama is a small oasis desert town and a tourist mecca for arriving from, or heading to, the high desert, altiplano, and salt flats of Bolivia, and for day tours in the area to some truly dazzling scenery. It’s just a desert, but unlike any desert you could imagine. We were constantly moved by its beauty. San Pedro seems to be divided into two sections. 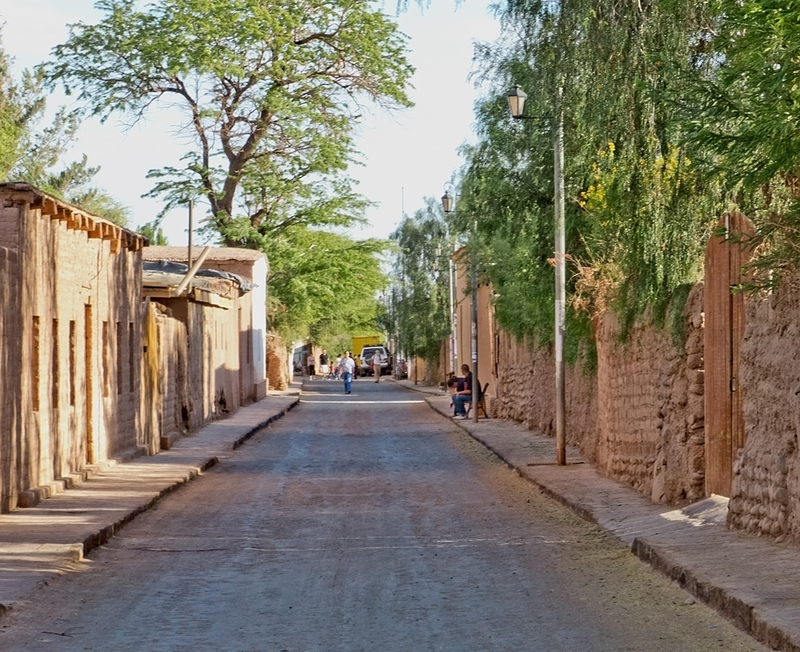 One section is beautifully preserved in the original mud brick and whitewash style, and houses everything a tourist could wish for – hotels, hostels, tour companies, local craft stores, restaurants, cafes, bars, and convenience stores. It’s beautiful. There is another San Pedro for the local population of about 5000, which, from the brief glimpse we saw of it, is not so pretty, however I imagine the endless tourist dollars make this a relatively prosperous place. I don’t think I’ve ever seen a place where there’s such a distinct division between the ordinary town and the facilities for tourists. 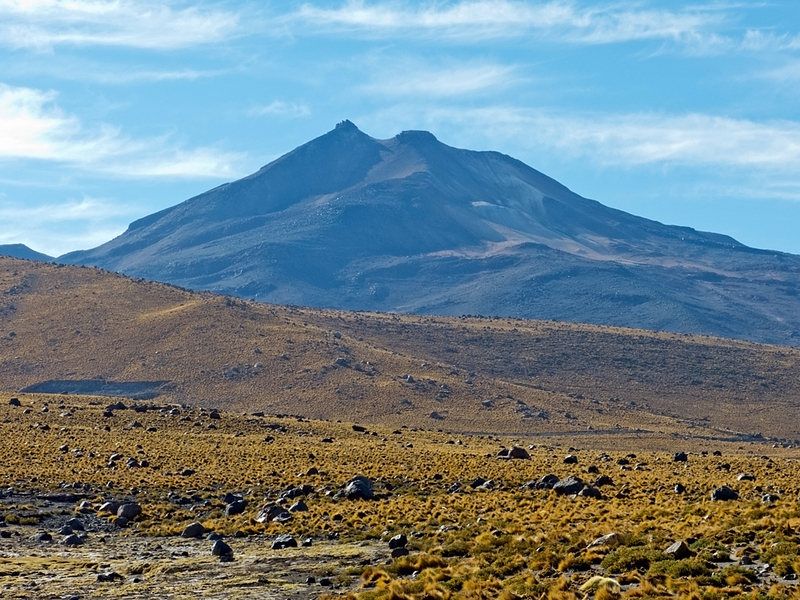 We usually go walking all over the place, and I’m sure we would have discovered that other San Pedro, but because of the altitude we were not feeling very energetic. San Pedro, at 2400 metres, was our first introduction to altitude. We planned five days there to give us some time to adjust. Our constant cry was more red blood cells, more red blood cells! When we’re usually so fit it’s not fun to be gasping after climbing a flight of stairs, and to have mild headaches, mild nausea, and sleepless nights. All this did not deter us however. There was too much to see in this incredible part of the world. 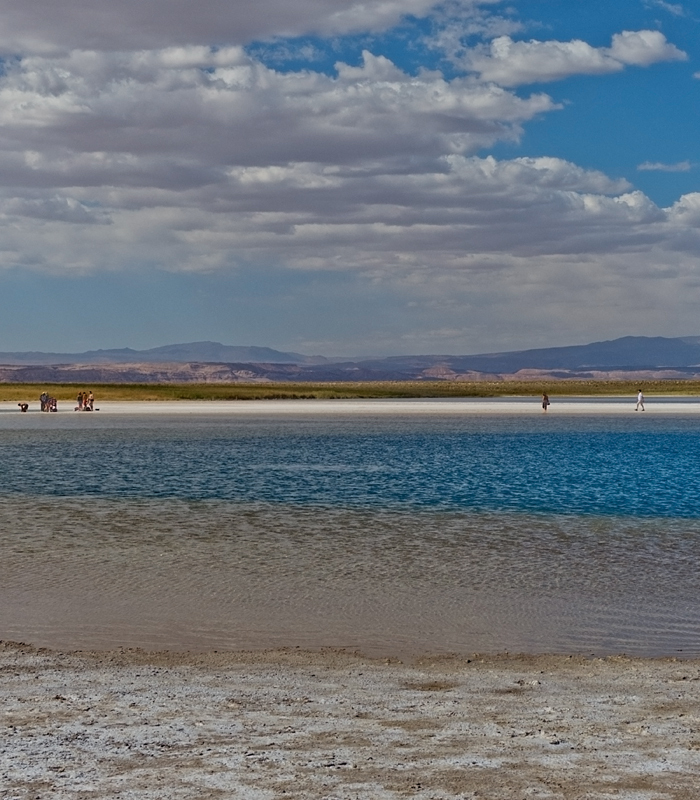 Our first excursion was to the Salar de Atacama (salt flats of Atacama) where we swam, or I should say floated, in the extremely salty Lago Cejar. This was followed by a quick visit to a freezing cold, extremely deep, fresh-water desert well to wash off the salt. We both declined, preferring the prickly salt on our skin to the freezing water. 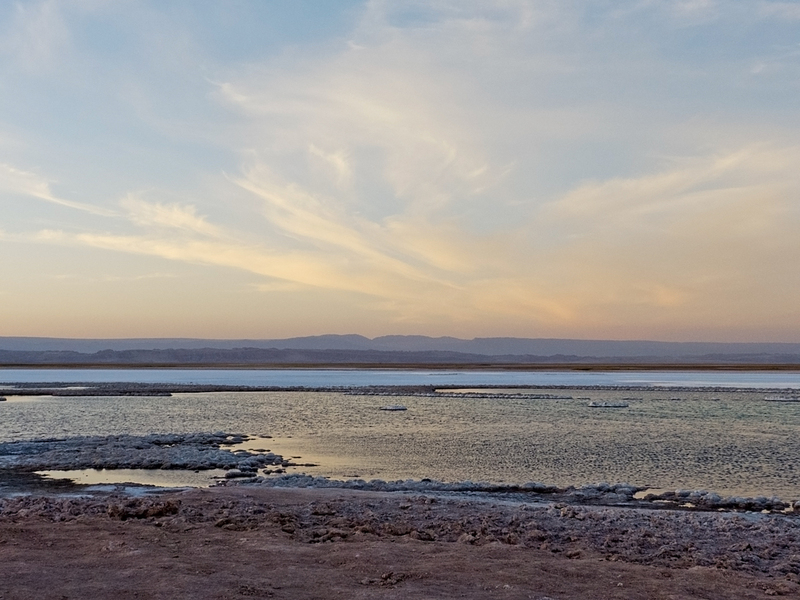 Finally we were taken to Lago Tebinquinche, which is less a lake than a large expanse of salt, covered in parts with a thin skim of water. 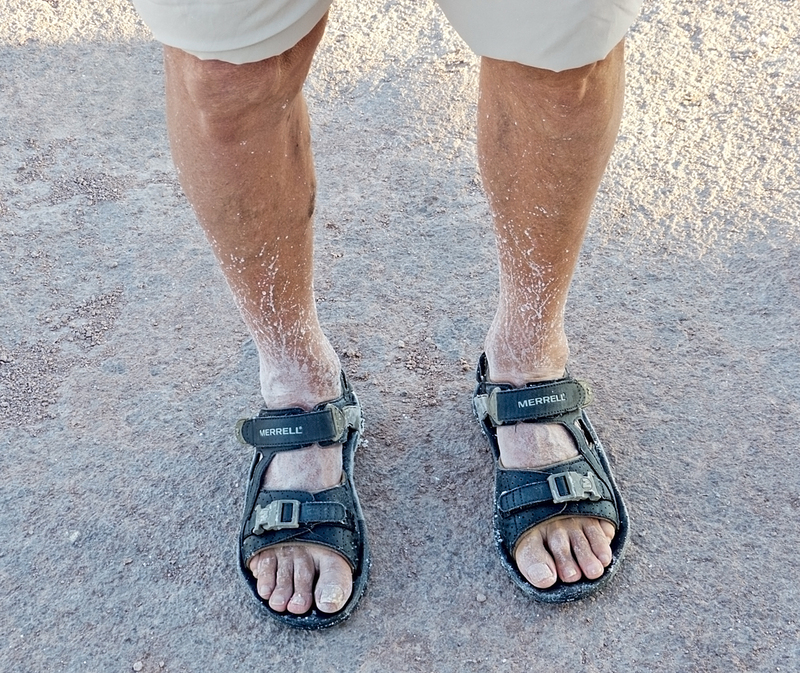 This is what Don’s feet looked like after we’d walked all over it. We stayed there for a sublime sunset, enchanted by the ethereal beauty of this strange landscape. We were also given Pisco Sours to drink which I’m sure helped increase our appreciation of the moment. 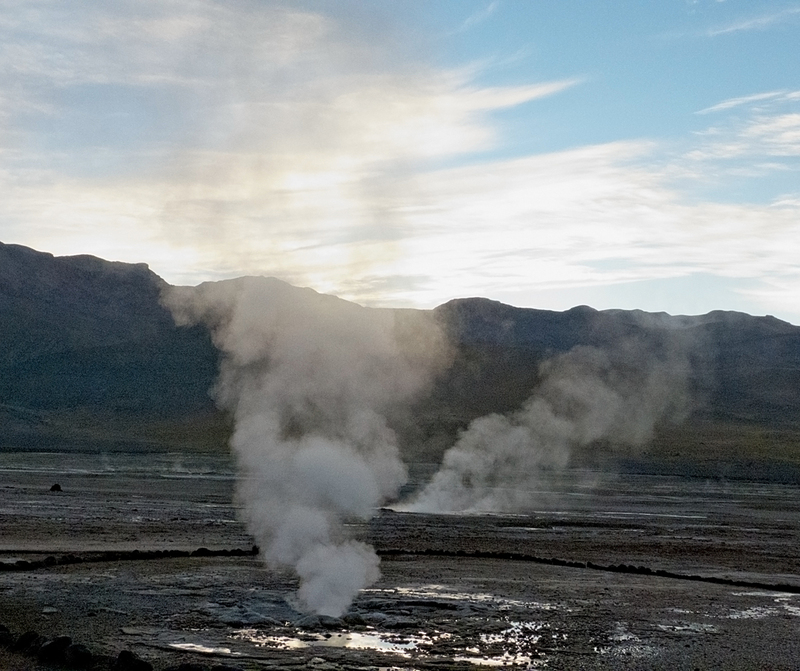 We got up at about three one morning, and were collected at a little after four to be taken to the literally breathtaking Geysers del Tatio at 4320 metres above sea level, an increase of almost 2000 metres in the space of a couple of hours. It was breathtaking in every sense. 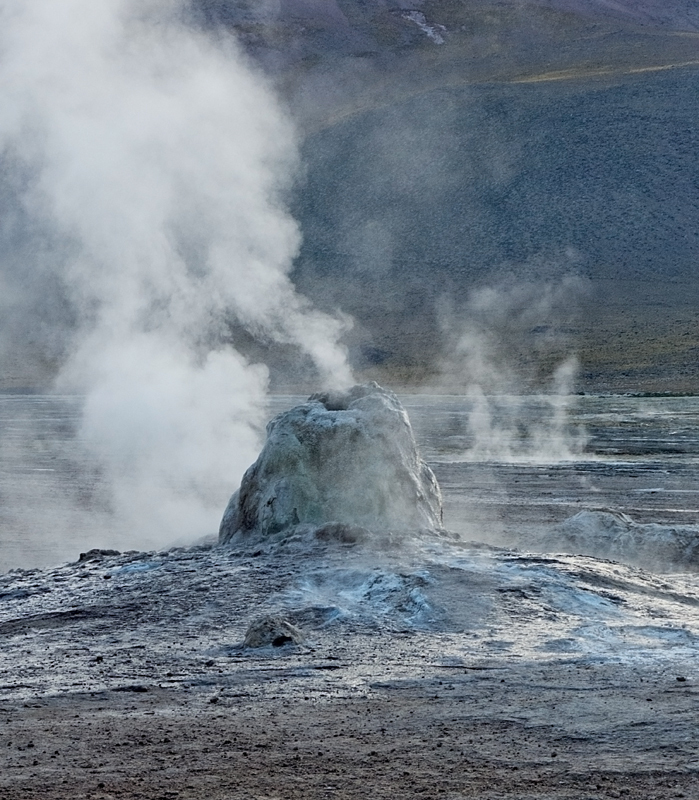 Tatio means grandfather and it is one of the highest-elevation geyser fields in the world. If you think the earth is still, quiet, inert, solid, a geyser field will soon change your mind. Don and I went our separate ways wandering around watching and photographing the earth steaming and bubbling, hissing and spouting. It is far from still. As long as we didn’t move too quickly we were fine. After a breakfast that included eggs boiled in one of the geyser spouts, we grabbed our daypacks and headed to the change rooms to have a soak in one of the hot pools. Don didn’t make it. Suddenly his heart went into tachycardia, and all he could do was sit. I went into a freezing cold change room, stripped down, changed into swimsuit, ran freezing and barefoot, and climbed into a pool that was either too hot or too cold depending on where you sat. Out within five minutes, running freezing back to the change room and drying and dressing at lightening speed. Back to Don. He’s still in tachycardia but okay. In my freezing rushing, and taking care of Don, and carrying both daypacks, I managed to lose my flipflops. I’ve lost so many things on this trip – I seem to be shedding stuff everywhere I go. On the way back to San Pedro we stopped at a small village for snacks. 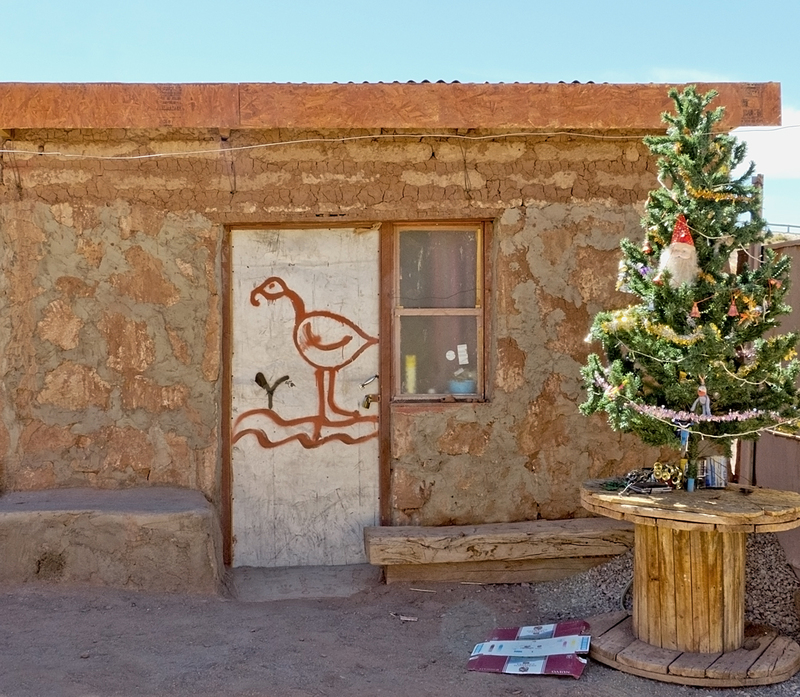 I think the village is mostly seasonal housing for shepherds. 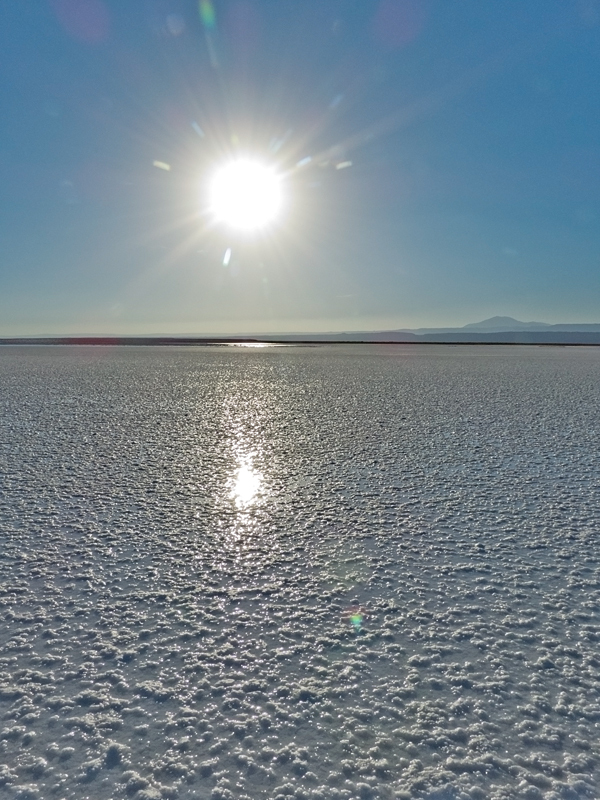 Next post: Things got even more amazing, and breathtaking, as we travelled on a three day 4×4 tour from San Pedro de Atacama to Uyuni, Bolivia, climbing to 5000 metres. Three days we won’t ever forget. Wonderful and inspiring photographs, thank you . You’re welcome, and thank you. It’s a wonderful and inspiring place. Worth visiting. Congratulations Alison and Don. I am really enjoying your blog and the wonderful photos. Looking forward to your next post. Well deserved award! Love reading! Thanks Sherry. So glad to hear you’re enjoying the blog. There was no question in my mind that you would win this award. You simply had to! Congrats to you both. I loved reading your trip through the desert. 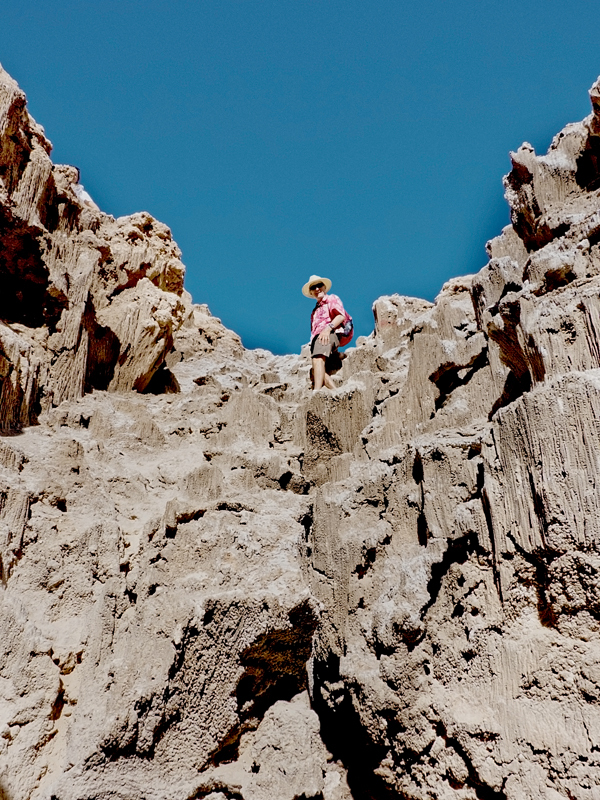 The photos of the Valle de la Luna and Valle de la Muerte are simply the best I’ve seen. National Geographic, take note! So looking forward to read about Bolivia, hoping that Don does not have a repeat altitude problem. Thank you so much Helga. We were completely surprised to have been nominated. Winning was one of those ‘wow!’ moments. Don’s fine, and we managed the higher altitudes – more on that in the next post. Congratulations on the award…how could you not have gotten it? Great post and photos here, as always. Thanks Angeline. We felt so honoured to be chosen. 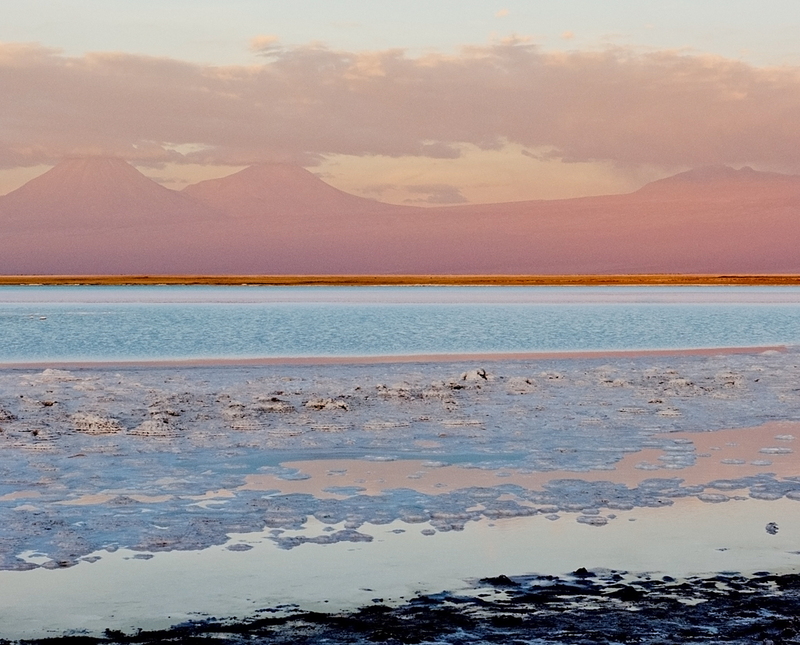 Atacama is a photographers dream. The landscape is so varied, beautiful and unique. Holy cr*p, that’s some amazing scenery. Is Don OK now? Oh, yes – astonishing place. 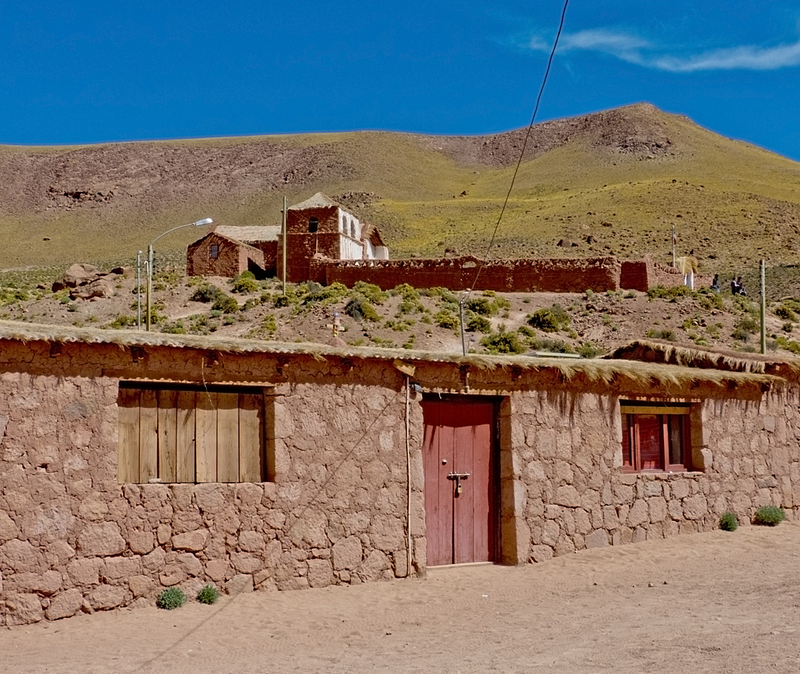 We really had no idea what we were going into, we just knew San Pedro was the way to get into the high desert of Bolivia. 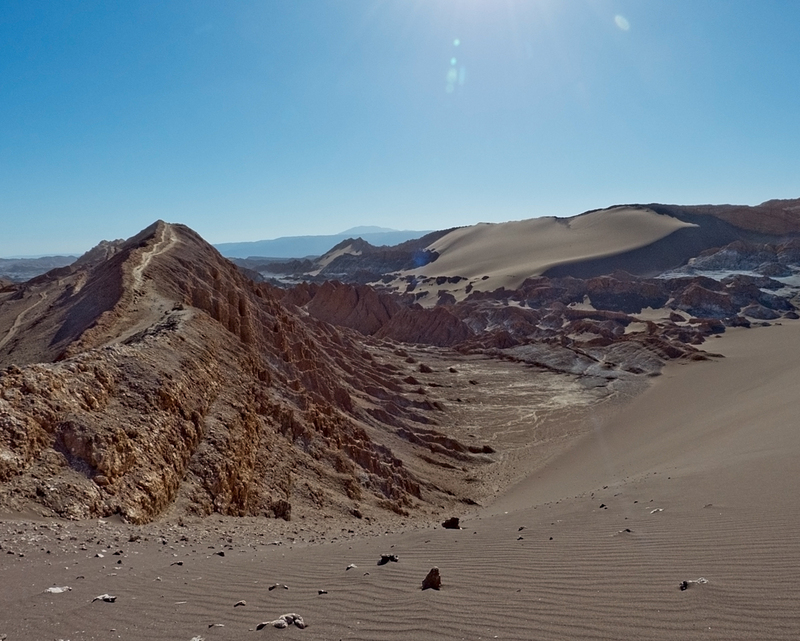 We knew we’d be going through the Atacama but had no idea how completely fabulous it is. Don’s fine. His heart specialist had assured him altitude would be fine, but then every now and then the tachycardia arises. But not since then, and we’ve been up to 5000metres, and been continuously now at 3.5 to 4 so we’re doing good. 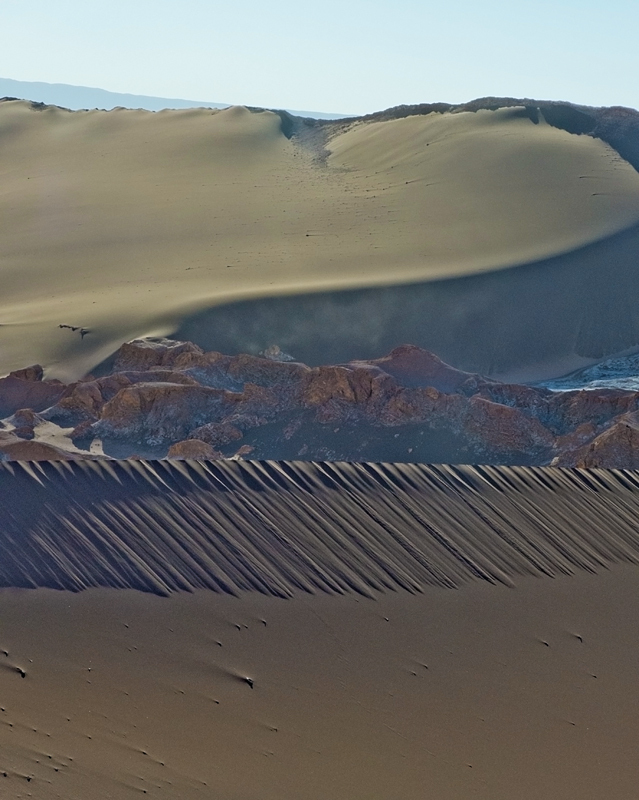 Alison, from your photos I cannot even begin to imagine the sheer size and scale of the Atacama… a liberal sprinkling of the words “breathtaking” and “spectacular” would have been completely justified in this case. The colours of the landscape seem even more vivid at altitude! 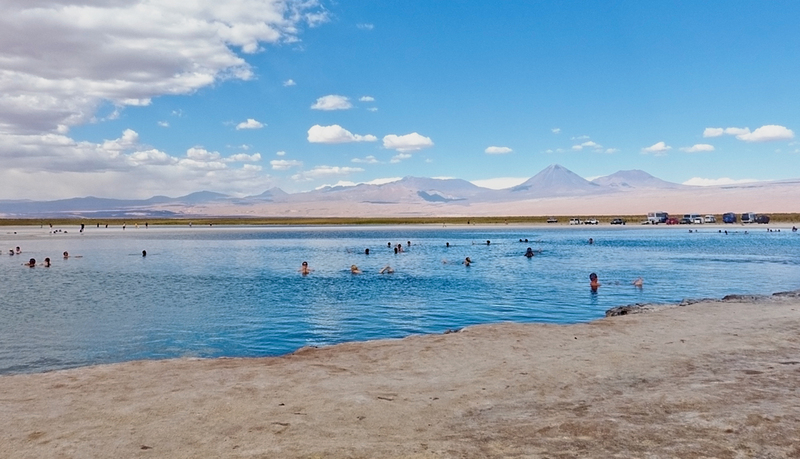 Thank you for introducing the Geysers del Tatio and the charms of San Pedro, I’m looking forward to the next post on Uyuni. Yes, you got it – the sheer size and scale – it is enormous, thousands of square kilometres, and endlessly varied and interesting. Colours are more intense at altitude. The lakes really are that blue (unless they’re bright turquoise green like we saw in Bolivia), and the reds and ochres so rich. It was a difficult post to write in that I couldn’t think of enough superlatives. 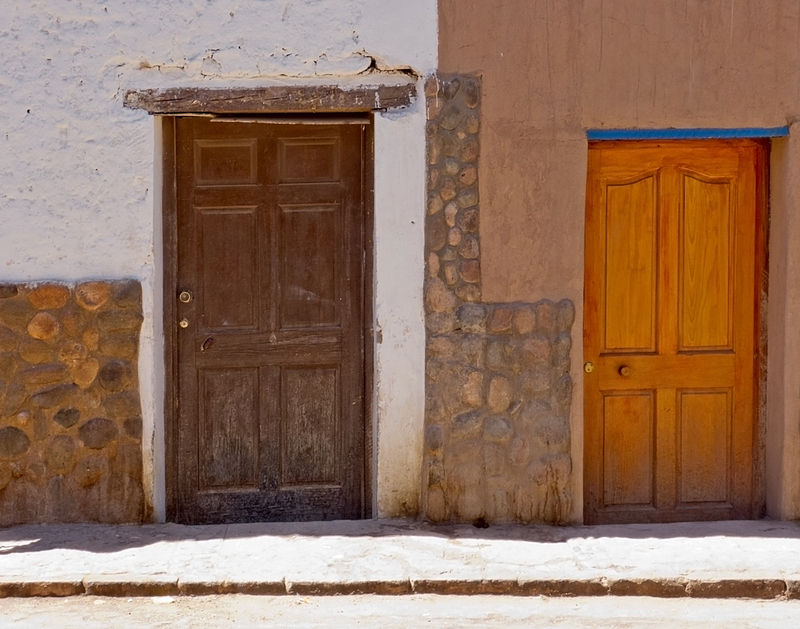 And even more so in Bolivia! 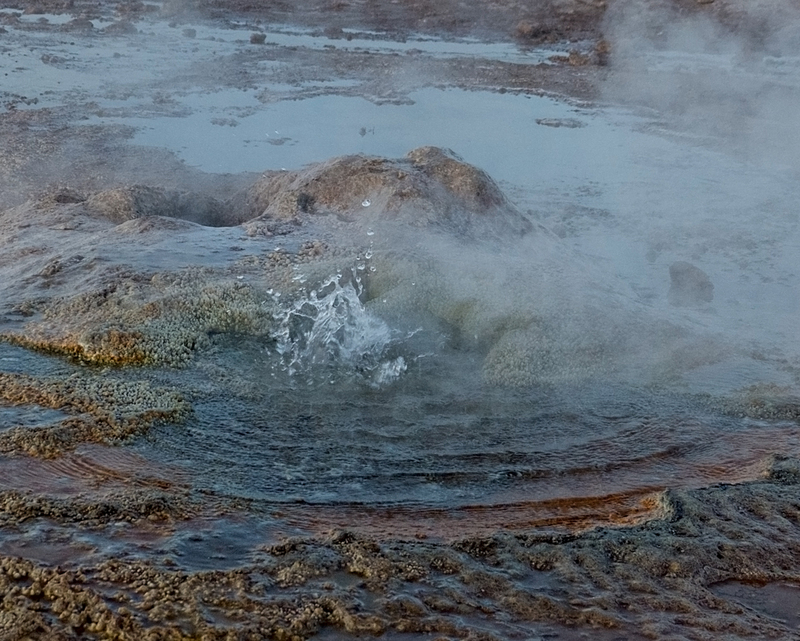 It’s just a taste of the geysers. The geyser field is huge, steam and boiling bubbling arising everywhere, so hard to choose which photos to use, I have dozens. Thanks Lucy. It must have been amazing to have been an archeologist in Peru – I would think an archeologists dream. In the last little while we’ve been to Sacsayhuaman, Pisac, Chinchero, Moray, and of course Macchu Picchu still to come in a few days, and Ollantaytambo. We are completely blown away every site we visit. Do get yourself to Patagonia! We’re hoping to do a trip into the Amazon from Ecuador. Thank you so much Sreejith. I’m glad you’re enjoying the blog. Congratulations on the award Alison. You deserve it and should be proud. Thanks Gayle. It was quite a thrill to win it. We’re just delighted. WOW! Double WOW! You two live life! It was a wow kinda place Cindy – so glad we went that way. 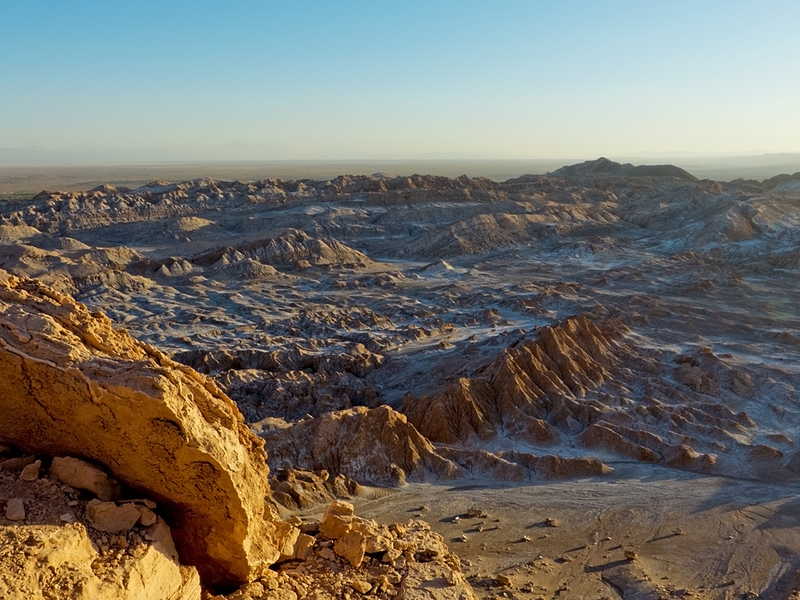 I think you could use just about every superlative there is to describe the Atacama. We could just settle for spectacular. Those llamas are fine. There are no longer any llamas or alpacas in the wild – they have all been domesticated in the same way cattle and horses have been domesticated (though there are still wild horses in various parts of the world). This means that every llama and alpaca you see will have an ear tag. 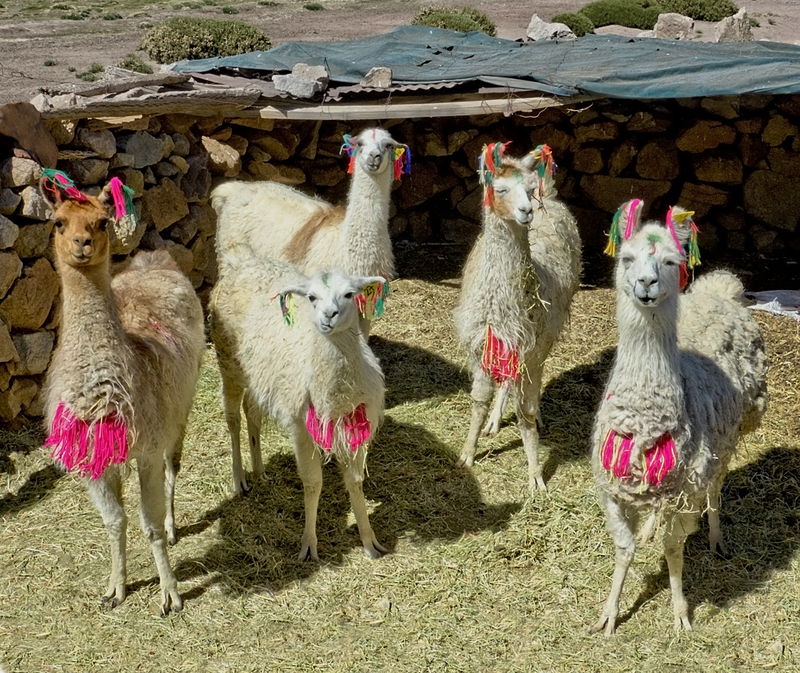 I’m thinking that these llamas have the decorations around their necks and on their ears for a local fiesta (of which there are *many*, or for tourist purposes, but I don’t think they are suffering. When I came upon them they seemed alert and healthy and were munching away on food in their pen, which was quite clean. There are llamas worse off in the towns where they are led around all day by a woman in traditional dress asking tourist if they want a photo. Even this I have trouble judging as long as the animals are properly cared for. It’s a way to make a living. Thank you so much stanito, and thanks for visiting. Still, we’ve long ago accepted that we’ll never see everything, and we loved what we did see of Chile. 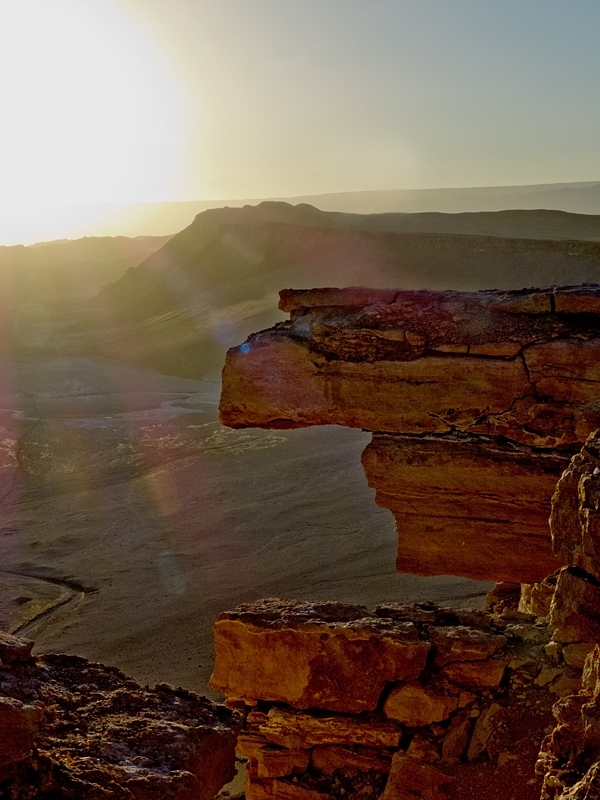 Congrats on your award, and even more so for you adventures in the Atacama! Gorgeous photos! Thank you so much. The award win was a great thrill for us both. 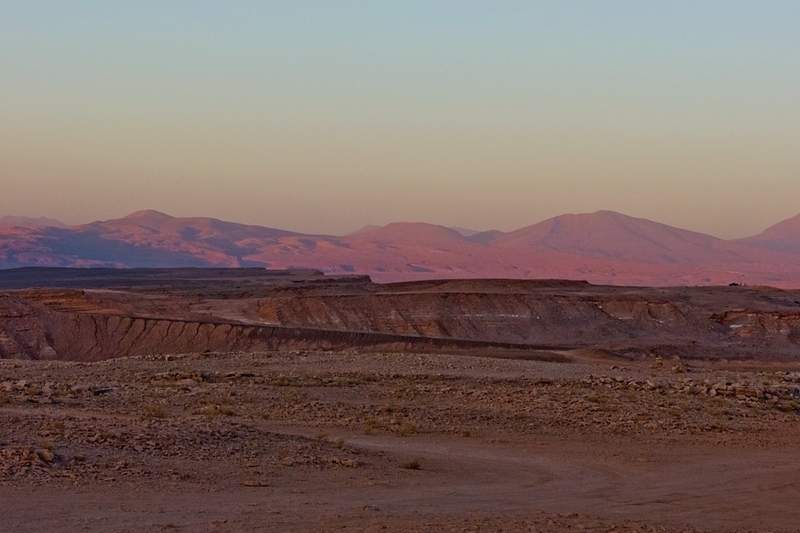 And the Atacama just about beyond words. Glad I managed to capture something of the beauty of it. Thank you so much Cora. I’m so glad you’re enjoying the blog. Thanks Paulette. Yes, it was an absolutely wonderful place to stop for a bit. Isn’t that pic of Don great?! BTW I vote for your shelter every day – hope you win again! So glad you won the award! And I love those llamas! Thanks Kelly. We love the llamas too. Don still smiles every time he sees that photo. What can I say that I haven’t said already? Love your blog, love your photos, love you and Don! Thanks Danny, glad you’re enjoying it. Amazing photos, glad to have found your blog. Thanks Sun for your kind words. Glad you enjoyed the post. The salty beach was wonderful – just floating with no effort. I’m with you – llamas make me smile every time. Don too 🙂 especially the photo above. Lucky to catch them all looking up (they were mostly busy eating). 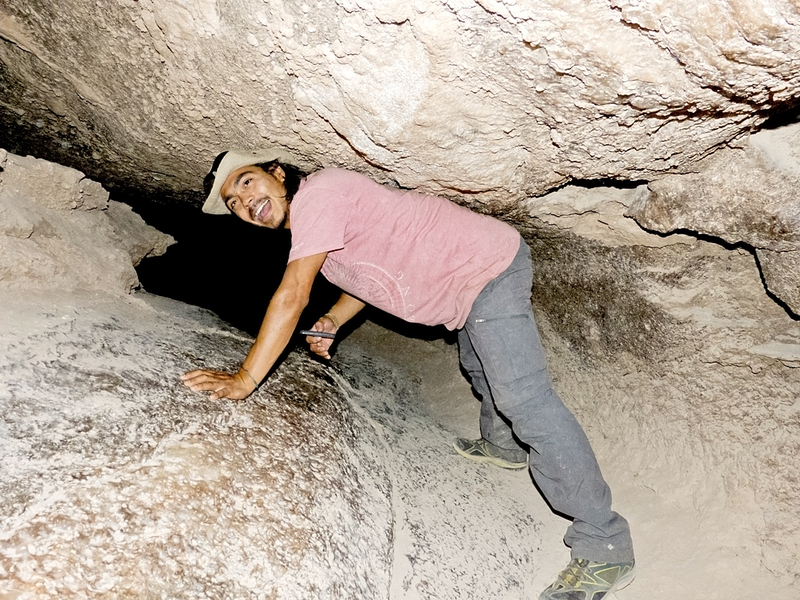 Can I ask if Marcelo was a private guide, and if so how you found him?